The University and one of its reservist employees have been recognised as providing excellent support to the armed forces reserves. Plymouth University has been recognised for its excellence in supporting armed forces reservists – and one of its employees has received a special award for her outstanding military work. The University received a Defence Employer Recognition Silver (DERS) award at the Lord-Lieutenant for Devon’s Annual Award Ceremony at the Council House, Plymouth on 29 October. The award was given for the University’s positive stance to employees and students from the armed forces community, allowing them the flexibility to undertake their commitments. The award was collected by Leading Hand Nicky Harrop, a programme administrator in the Faculty of Health and Human Sciences, who in turn picked up an award in her own right – a HM Lord Lieutenant of Devon Award for Meritorious Service to the Reserves. With seven years’ service in the Royal Navy reserves, Nicky was awarded the honour for her impeccable demeanour, flexibility and commitment, as well as exemplary conduct during her reservist career, which included a six-month tour to Dubai acting as a liaison between the Royal Navy and Merchant Navy. 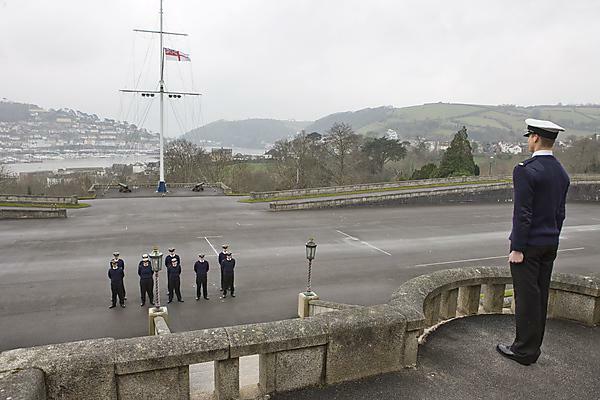 Based on HMS Vivid at Devonport Dockyard, Nicky has thrown herself into everything from fundraising to mentoring new recruits, and her certificate even describes her conduct as ‘successfully shouldering responsibilities that would normally be assigned to personnel of a much higher rank’. Having been founded as a school of navigation in 1862, the University has developed proud links with a number of maritime and defence organisations, including Britannia Royal Naval College, HMS Drake and HMS Collingwood and the Royal Marines School of Music (RMSoM). The partnerships enable the University to accredit modules and degrees through the organisations, including a postgraduate diploma in Applied Navigation with HMS Drake and HMS Collingwood and a Bachelor of Music degree at the RMSoM. It has also recently signed a memorandum of understanding with NATO Maritime Interdiction Operational Training Centre (NMIOTC) to establish the joint delivery of a Masters in Applied Strategy and Maritime Security. It’s great that I’ve been able to balance my job at the University with my reservist activities and I look forward to continuing with the reserves for a long time yet.